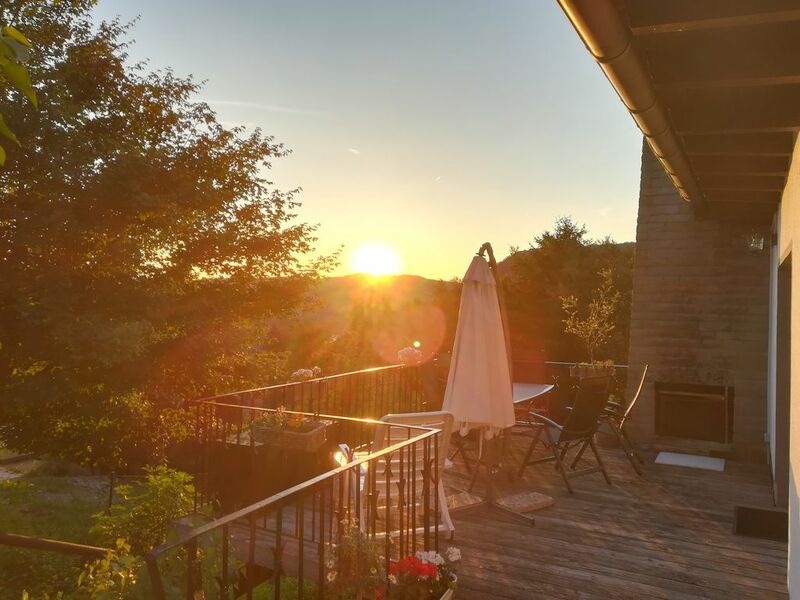 Comfort holiday home **** for up to 8 people - 4 bedrooms, including 1 children's room, panoramic balcony and terrace, fireplace, barbecue, panoramic view of the Diemelsee (only a few minutes walk away!) and the Sauerland. Incl. Sheets and towels - Perfect for nature lovers - Let your mind wander - Kids and dogs are welcome, Non smoking house, final cleaning is free! The holiday home Nele is located in a quiet cul de sac above the Diemelsee in the up-and-coming climatic health resort Diemelsee-Heringhausen. It offers a breathtaking panoramic view of the lake and the wide valley. The Diemelsteig / Panoramaweg is only a few meters away from the house. The lake is only a few hundred meters away. Willingen is only 14 km away. Whether you want to swim, hike, fish, biking, or go skiing .... here you are exactly right! In the middle of the countryside with 800 sqm garden! Pure relaxation! The renovated 4-star holiday home offers superior comfort incl. Wi-Fi and hi-fi systems and 2 TVs and is equipped with 4 bedrooms (including a children's room with a bunk bed and couch). Up to 6 adults and at least 2 children can enjoy the holiday in our beautiful holiday home Nele. Living room with panoramic window and fireplace. Enjoy the wonderful surroundings (mountain panorama and the lake, hiking, skiing in Willingen, or cycling) ... you have many possibilities. The terrace offers stunning views of the lake and the sprawling valley. A fireplace and barbecue are also available on the terrace. The bedrooms are on 2. Distributed floors. The bedroom upstairs has a satellite TV. In the Valley View bedroom you have a wonderful view of the valley from a small terrace and it offers a JBL sound system for your entertainment. Let the soul dangle in the beach chair on the small terrace. The master bedroom offers all the comforts and is equipped with a sound system by Harman Kardon. The nursery (The Bear Cave) is equipped with a loft bed and a couch. A small selection of toys and a loudspeaker are available. A ping pong table for playing in the yard is also available. A guest toilet is also available, as well as a bathroom with tub / shower and washing machine, which is accessible via the area of ​​the Captain's carpenter. Another shower and sink is located in the Valley view bedroom. Gut und geschmackvoll eingerichtet. In der küche fehlt nichts Toller blick. Netter vermieter. Freundlicher Vermieter, sehr schöne ruhige Lage und Aussicht. Alles sehr schön sauber. Ein zuvorkommender, netter Vermieter bietet ein klasse Haus mit tollem Ausblick. Das Haus ist sehr schön und es ist alles vorhanden, was man braucht. Die Aussicht ist wunderbar und die Lage sehr ruhig. Der Vermieter wohnt nebenan und ist sehr freundlich.